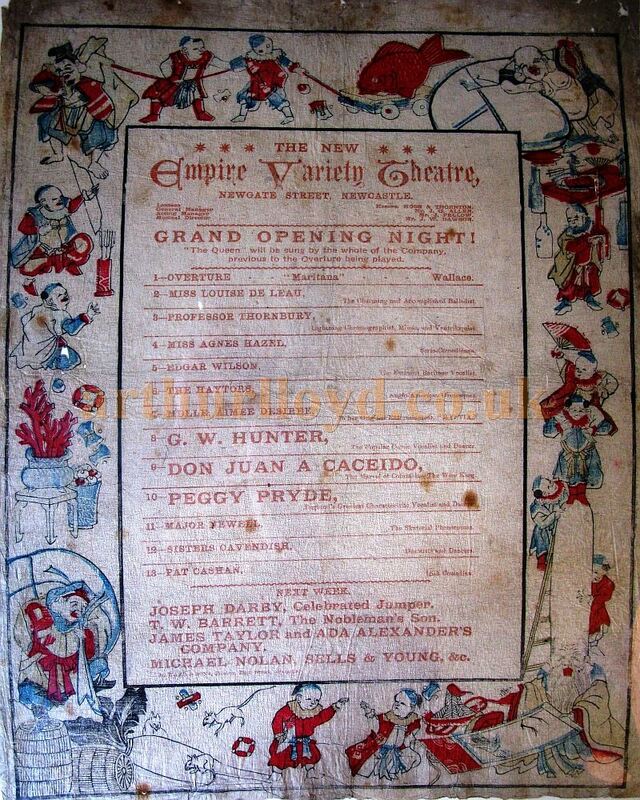 Above - A Programme for the Grand Opening Night of the Empire Variety Theatre, Newcastle on Monday the 1st of December 1890 - Courtesy Byrnice Reeds. On the Bill were Louise De Leau, Professor Thornbury, Agnes Hazel, Edgar Wilson, The Haytors, Aimee Desiree, G. W. Hunter, Don Juan A Caceido, Peggy Pryde, Major Yewell, The Sisters Cavendish, and Pat Cashan. 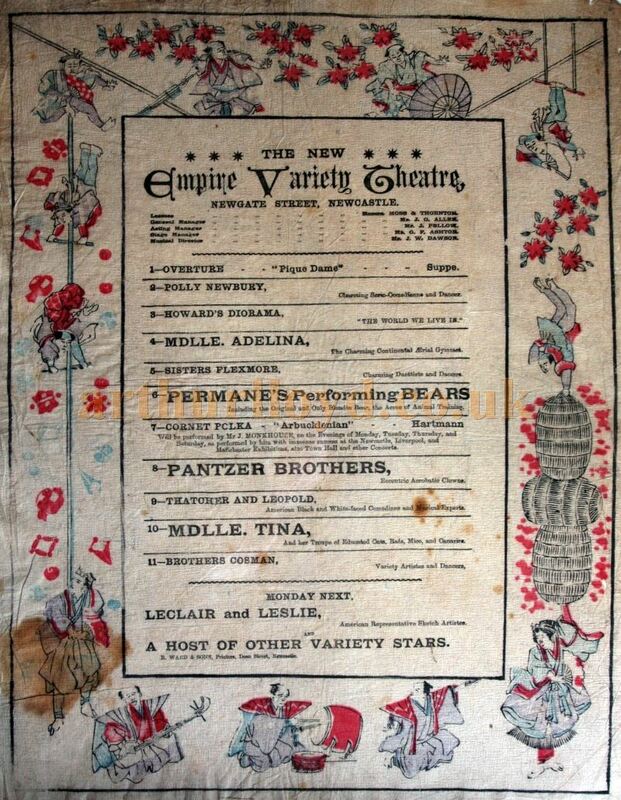 Above - An Early 1890s Programme for the Empire Variety Theatre, Newcastle - Courtesy Byrnice Reeds. On the Bill were Polly Newbury, Howard's Diorama, Mdlle Adelina, The Sisters Flexmore, Permane's Performing Bears, The Pantzer Brothers, Thatcher and Leopold, Mdlle Tina, and The Brothers Cosman. 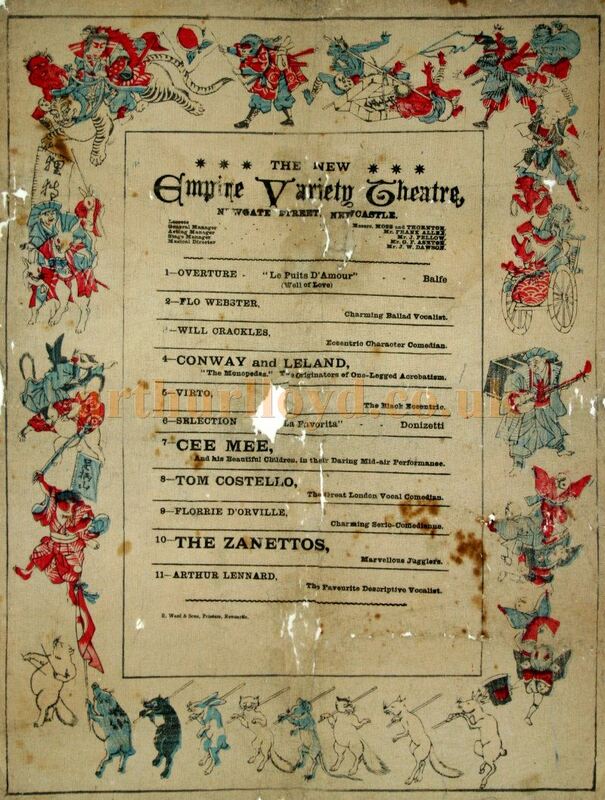 Above - An Early 1890s Programme for the Empire Variety Theatre, Newcastle now held at the Tyne and Wear Archives (catalogue reference DX1475/1) - Courtesy Byrnice Reeds. On the Bill were Nancy Lee, Edwards and Kenyon, Signor Louis Luppi, McOllive and McKane, Will Mitcham, Adrienne Ancion, E. C. Dunbar, Walter Bellonini, and The Silver Belle Quartette. 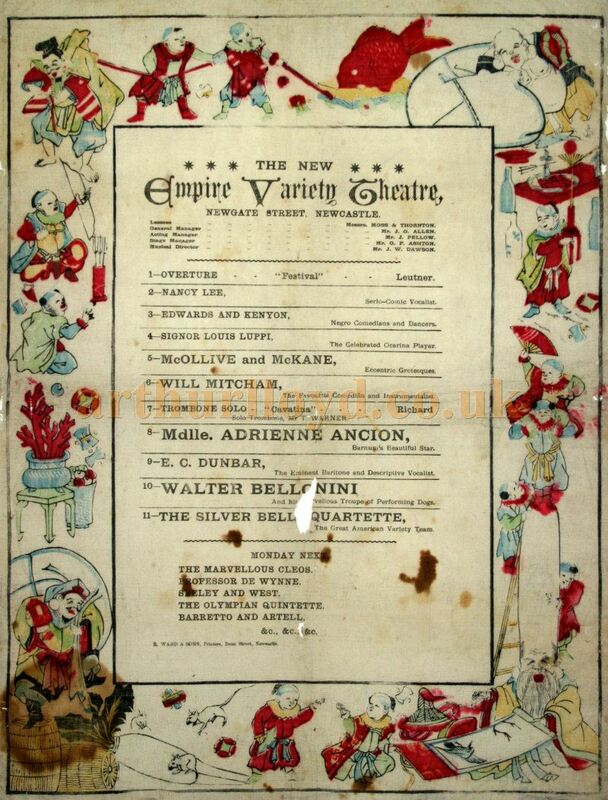 Above - A Programme for the Empire Variety Theatre, Newcastle on August the 6th 1892 now held at the Tyne and Wear Archives (catalogue reference DX1475/1) - Courtesy Byrnice Reeds. On the Bill were Flo Webster, Will Crackles, Conway and Leland, Rirto, Cee Mee, Tom Costello, Florrie D'orville, The Zanettos, and Arthur Lennard. A review for the above programme's production was published in the ERA on the 6th of August 1892 saying:- 'EMPIRE VARIETY THEATRE.- Lessees, Messrs MOSS and Thornton; General Manager, Mr Frank Allen; Acting-Manager, Mr J. Pellow. - The holiday programme here is varied and highly interesting, the principal attraction being the marvellous entertainment given by Cee-Mee and his handsome children in their daring and sensational mid-air performance. Included also in the company are Miss Flo Webster, ballad vocalist; Arthur Lennard, descriptive vocalist; Virto, black eccentric; Tom Costello, vocal comedian; Miss Florrie D'Orville, serio-comedienne; the clever jugglers, the Zenettos; Conway and Leland, monopedes; and the popular and amusing Will Crackles, who is received nightly with much favour.' - The ERA 6th of August 1892 - Courtesy Karen Nesbitt whose Great Grandfather and his brothers were the Zanettos, featured in the programme.